High End Systems Technospot (EN) | PRO MUSIC, s.r.o. Designed for a wide variety of small and medium scale performance applications, Technospot is a compact hard-edge luminaire with exceptional value and performance. A full featured fixture designed for club, stage, and studio applications where environmental durability and high quality output are required. Technospot features smooth CMY color mixing and a fixed color wheel. Two rotating Lithopattern® wheels, each with six patterns plus open, provide a large number of output patterns and images. The output can be further enhanced with a rotating prism and an animation wheel. Following the professional lighting, large exiting aperture trend, Technospot features a prominent 5.3 inch lens, 11° to 34° zoom, and over 12,000 lumens of output. With its incredibly efficient optics, Technospot outperforms other luminaires in its range and projects clean crisp images that cut through any wash. Rotating and animating patterns, four-facet prism, fast iris, unique animation wheel, and superb color systems make Technospot a great value in low-cost automated lighting. 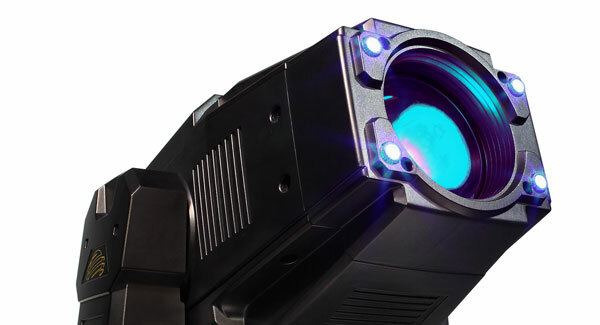 Technospot also features the indigo highlighter which provides additional light output from four 1-watt indigo Leds, thus increasing the layering abilities of the large aperture fixture. Technospot offers designers and operators a versatile, fully integrated system with unprecedented brightness, speed and accuracy for a light of its kind. 575w mini-fast fit lamp – 750 hrs.